Howdy, Gameologians, and welcome to our weekly thread for the discussion of weekend gaming plans and recent gaming glories. I don’t foresee getting much time to play anything this weekend, what with The Big Game™ taking up the TV. 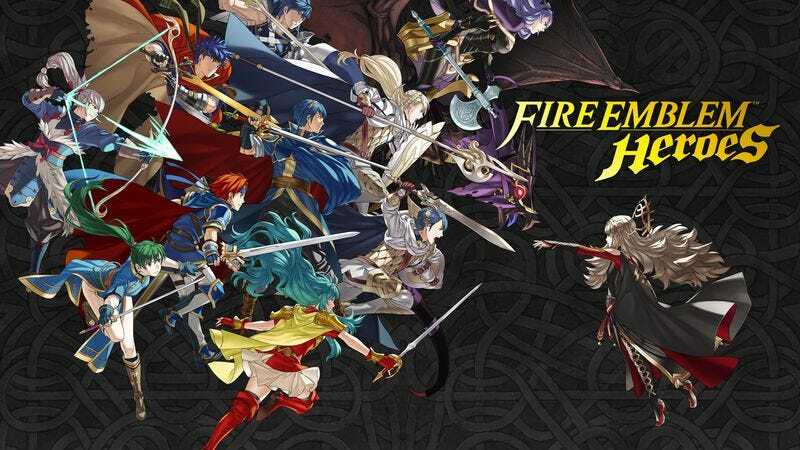 That said, I’m looking forward to getting a taste of Fire Emblem Heroes, Nintendo’s next attempt at mobile gaming that launched on Android and iOS yesterday. I was ultimately way higher on Super Mario Run than most folks, but Heroes is a drastic change from that game’s “pay $10 and unlock it all” approach. This is full-on free to play, asking users to pay real money for orbs they can use to activate a virtual capsule toy machine that spits out random Fire Emblem characters for your roster of medieval fantasy soldiers. You can earn orbs just by taking on the game’s battles, which play out like scaled-down versions of the series’ traditional turn-based conflicts, but you’re encouraged to buy more than one hero at a time and blow tons of orbs at once, since the price drops with each successive summon. It’s exactly the kind of exploitative free-to-play methodology that I absolutely hate, so my expectations are low. But I’m going to give it a fair shot—you know, when I’m not shoving junk food in my face and screaming about how much I hate the Patriots.